Ingredients (for 2): 2 medium chicken breast, 2 tsp. Mrs. 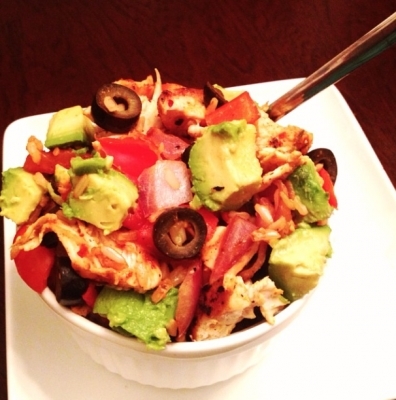 Dash chipotle seasoning, 3/4 cup cooked brown rice, 1 small can chopped olives, 1 Roma tomato, 1 avocado, 3 tbsp. minced red onion. Instructions: Season chicken and grill on greased grill Pam. Cook rice. Dice tomato, avocado, and onion... Then mixed together with chopped olives. Dice up chicken. In large skillet mix chicken, rice, and veggies and fry for about 5 minutes so all flavors combine.